GREAT SOIL = GREAT RESULTS! 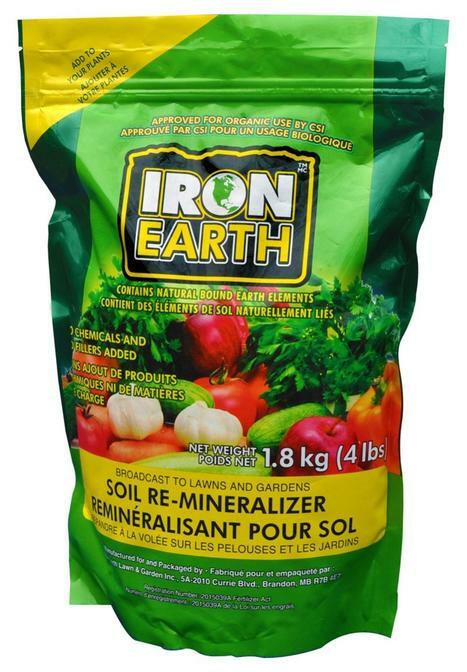 Add IRON EARTH™ to your soil to re-mineralize your garden. Approved for Organic use by CSI. IRON EARTH™ is an exciting new product for all your plants, flowers and trees. IRON EARTH™ is a natural fertilizer for plants. Add IRON EARTH™ to your flowers, trees & shrubs, lawns, tropical plants, sprouts, vegetable garden and fruit trees to see the amazing results of this natural fertilizer. This organic micronutrient fertilizer will add minerals back into soil, creating thick grass and flavourful produce. The 0.5 lb bag is perfect for 5-8 flower pots or individual plants, 5 small trees or 40 sq. ft. when broadcast. IRON EARTH™ adds nutrients and humate back into the soil and the plants. IRON EARTH™ natural plant fertilizer can be added to indoor and outdoor plants, trees, bushes, grapevines, as well as your lawn! Great results in your vegetable garden without eating any chemicals whatsoever! IRON EARTH™ natural plant fertilizer adds minerals and essential acids to the soil at the location of the plant's root system. IRON EARTH™ natural plant fertilizer accomplishes this by adding these nutrients back into the soil. Each 4 lb. bag supplies 45 individual plants.